Reference Information - CD 113 Hemingray > New production 1941 mold script embossing anomaly. New production 1941 mold script embossing anomaly. There has been much discussion and speculation about these 1941 dated mold Hemingray-12's that have the script embossing on them and WHY Hemingray would revert back to script embossing ONLY for the year 1941 when stamp embossing was the SOP of the time? To date, we have come to no solid, concrete reason or explanation as to why script embossing and ONLY 41' dated molds. In any case, I have found a new variation/anomaly to this new production/old style embossing 12. One that has both script AND stamped embossing. I have 2 insulators to show here. One is the all script embossed 12, the date code is: 5-41 :::. indicating mold 5 and used up until 1948. This is 100% script embossed on front and rear skirts. All numbers are hand done. The piece I am speaking of is the topmost skirt shown in the photo. Mold date code is: 4-41 ::. indicating mold 4 and used up until 1946. The -12 is stamp embossed and the rest of the embossings on front and rear skirt are all script. The 4-41 is script embossed. So they used a machine stamped hyphen and 12 on the front, and the hand engraved hyphen and 1 on the rear skirt. 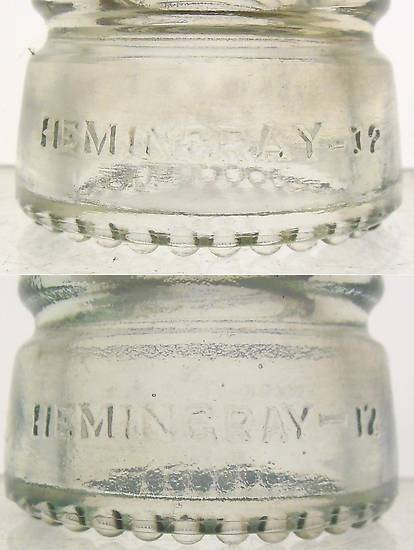 We know that Hemingray DID have stamp embossing punches to use, but why didn't they use them? And WHY did they stamp emboss ONLY -12 on one mold and do the rest in script? In the collage, the upper embossing is the script/stamp embossing mix, and the lower is the 100% script embossed insulator. This throws another monkey wrench and MORE questions into an already puzzling issue. What are your thoughts? Contact me if you want to see more photos and share on ICON.